On the surface, there’s not much diamonds and ferns have in common. However, the Australian Diamonds and New Zealand Silver Ferns have been setting the benchmark in netball for years. Netball has been played for over a century, and during that time there’s been no bigger rivalry than between Australia and New Zealand. With all 14 Netball World Championship titles and five Commonwealth Games gold medals between them the two teams have been at the top of the netball food chain for years. Former Australian coach and current coach of South Africa Norma Plummer agrees that when it comes to Australia and New Zealand, the netball rivalry is the best. ”Australia versus New Zealand in netball surpasses everything else in sport between the countries,” Plummer told the Sydney Morning Herald. The rivalry goes back 80 years to when Australia first played international netball in 1938 against New Zealand. Australia won their first encounter on the court, as well as their second one. However, New Zealand got a taste of victory in 1948 by winning an unofficial nine-a-side game against the Australians. In 1963 the first World Tournament [also known as the World Championships and currently the World Cup] was played in England, and Australia cemented themselves as world champions with a tight one-goal victory over New Zealand, the first of many close games to come. New Zealand won the next World Tournament, but with Australia then turning the tables at the following World Tournament the rivalry continued to grow. Netball became a Commonwealth Games sport in 1998, and unsurprisingly given their historical dominance Australia and New Zealand went head-to-head for the first gold medal, with Australia victorious. The 1999 World Championships made Australian player Sharelle McMahon a household name. McMahon scored for the Diamonds with two seconds remaining against the Ferns in a one-goal thriller. For McMahon, much of her focus was directed towards being able to beat New Zealand. “A lot of what we were doing throughout the year was geared towards making sure we could beat New Zealand, such was their ability to perform on the big stage,” McMahon told The Australian. At the 2002 Commonwealth Games, Australia and New Zealand were so hard to separate that the gold medal match went into double extra time before Australia pulled ahead and won. In 2005, Australia were demolished by New Zealand 61 – 36 in their biggest loss to the Ferns in a test match. With Australia hosting the Commonwealth Games in 2006, the stage was set for a Diamond’s resurgence in the sport. However, the Ferns won the gold medal match by five goals against their rivals. The competition between the two countries didn’t end with their national teams, either. Putting the rivalry aside, they joined together to form the ANZ Championships in 2008. New Zealand teams struggled in the trans-Tasman league, with 2012 champions the Waikato-Bay of Plenty Magic the only New Zealand team to win a premiership. As the sport continued to grow, the first five-a-side Netball World Series [FastNet now Fast5] was played in Liverpool in 2009, with New Zealand winning the tournament. 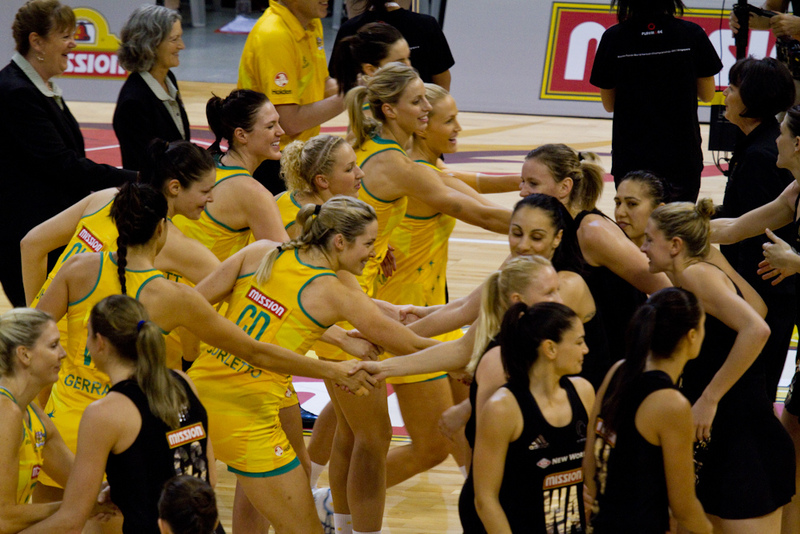 The win established the start of New Zealand’s dominance in Fast5, while the newest version of the game is the only title Australia is yet to win. The Diamonds and Silver Ferns found themselves in another shootout at the 2010 Commonwealth Games. Both teams had fantastic players in their line-ups, and some stood up while others crumbled under the pressure of the longest netball match ever played between the two sides. Eventually, Maria Tutaia [now Folau] slotted the winning goal for the Silver Ferns in double extra time. With that epic matchup still fresh in their memories, the Diamonds went on to win the 2011 World Championships against New Zealand by a goal. The following World Championships saw Australia win against their arch rivals once again. It was the sixth time the teams came up against each other for the gold. In 2016 the decision was made that the nations would go their separate ways at the domestic level. The ANZ Championship made way for Australia to introduce Suncorp Super Netball, a competition exclusively for Australian teams. Netball New Zealand made it clear to their players that anyone who decided to play in the Australian league would no longer be eligible to represent their country. In a move that shocked many, one of New Zealand’s best players, Laura Langman, decided to continue playing in Australia. With a Langman-sized hole in their line-up, and despite beating the Diamonds in the 2017 Quad Series, the Ferns went downhill quickly from there. They lost the 2017 Constellation Cup 4 – 0, lost to Australia and England in the January 2018 Quad Series and then lost to Jamaica twice before heading to this year’s Commonwealth Games. While New Zealand was drastically falling, another netball powerhouse was on the rise. The England Roses developed their side with many players participating in Suncorp Super Netball and getting regular games against the other top netball nations thanks to the introduction of the Quad Series in 2016. Much of England’s Commonwealth Games team played together in the 2017 Fast5 Netball World Series which they won. For many it came as a shock when the Roses beat the Diamonds on Australian soil in this year’s Commonwealth Games; however, the signs were there for those who had been paying attention. The Diamonds underestimated the Roses, and arguably became a little too secure knowing that the Ferns were having a shocking few months that continued into the Games when they lost to Malawi for the first time in history. New Zealand’s dismal year saw them drop from second to third in the International Netball Federation’s world rankings. After that fall Netball New Zealand shook up their system, bringing in successful Sunshine Coast Lightning coach Noeline Taurua and granting an exemption to Laura Langman and Maria Folau to represent the Ferns and also play in Australia. Despite Australia and New Zealand no longer being the top two in the world, their rivalry is as strong as ever. New Zealand’s one win in the 2018 Constellation Cup series against Australia looks to have reignited the fire between fans. “Silver Ferns crushed the Diamonds yeah baby #NZLvAUS,” one ferns fan wrote. “When the SILVER FERNS are 39-33 [Homer Simpson angry yelling gif],” an Australian fan wrote. With next year a Netball World Cup year, the rivalry between the two netball nations will continue as New Zealand try to re-establish themselves at the top while Australia tries to retain the World Cup after their loss at the Commonwealth Games. Photo: ‘Australia VS New Zealand’ by Stanley Yeo available here and used under a Creative Commons Attribution.